Blondes may have more fun, but they also have their own set of hair woes come summertime. (Think fading colour, chlorine-induced green, and brassiness.) To help golden-haired gals keep their locks in the best shape possible, John Frieda is generously offering one lucky Solo Lisa reader a gift basket stuffed with $150 worth of products customized for blonde hair. A winner will be chosen randomly when the contest ends on Monday July 8th, 12pm PST. Good luck! [UPDATE—JULY 8, 2013] The winner is Shelley B. Congratulations, Shelley! I'm trying to keep my blonde "do" from fading. Being blonde is hard work, so thanks for the giveaway. BTW, if anyone knows of a good hair stylist/colorist in Vancouver, please pass on the details. Even fake blonds have more fun! His Frizz Ease serum is the best for curly hair. would love this for my blonde-ness!!! Congrats on winning the giveaway, Shelley! 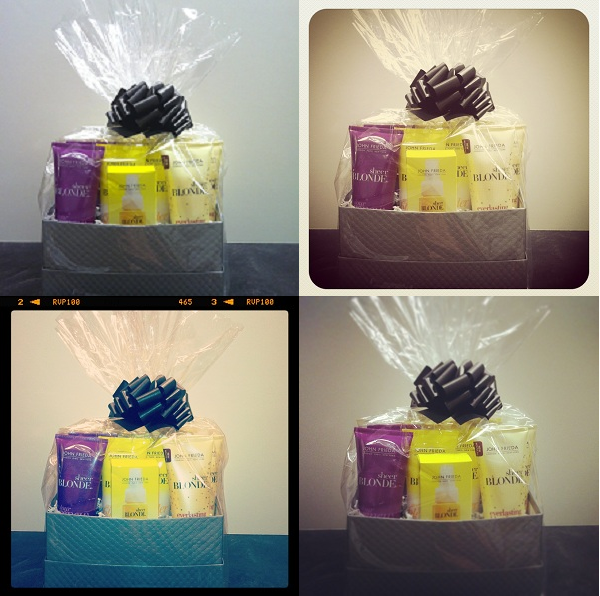 Someone from John Frieda will be in touch with you about claiming your prize. Enjoy the hair products! Great give away, my blonde hair could use some TLC. Tweeted also https://twitter.com/tazzmay/status/352576621217189888 @tazzmay - twitter handle. Would love to win, John Frieda has great products. Wat a pretty gift basket! I would be thrilled to win this! What an awesome giveaway! John Freida is where it's at - love all their hair care products. I've had hair every colour and can tell you - blonde is best!